The Freeman Store and MuseumHistoric Vienna Inc.
On September 22, 2011, the Virginia Department of Historic Resources (DHR) accepted Vienna’s application and placed the Freeman Store and Museum on the Virginia Landmarks Register. The Freeman Store and Museum is the only structure in Vienna to hold this highly sought after designation. The effort to gain official recognition of the Freeman Store and Museum’s historic importance began in January 2011, when Vienna’s Town Council approved our proposal to undergo the rigorous application process. 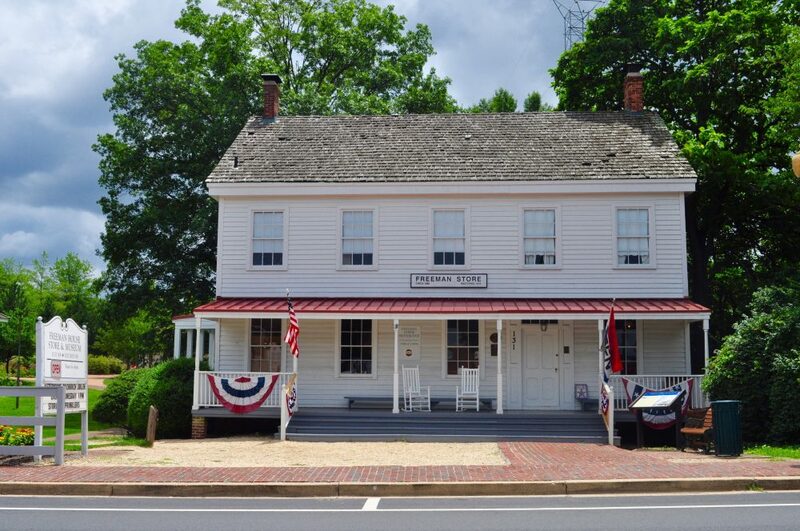 The Freeman Store and Museum earned a place on this elite list based on its association with events that have made a significant contribution to the broad patterns of our history, including events related to commerce, military, politics and government. In addition to serving as the site of historically influential events, the Freeman Store and Museum is associated with the lives of significant persons in Vienna’s past, including Leon Freeman, who served as the first president of Vienna’s Volunteer Fire Department. The timing of the Freeman Store’s designation as a historic structure is fitting, as 2011 marked the beginning of the 150th anniversary of the American Civil War. Built in 1859 and originally known as Lydecker Store, the Freeman Store and Museum operated as a general store until the late 1920s, after which it served as a residence until 1955. The building also operated as a post office and served in various capacities for both the Union and Confederate armies during the Civil War. In 1969, the building was was sold to the Town of Vienna by Leon Freeman’s daughter, Dorothy. In 1976, the Town of Vienna restored the building to its earlier appearance as a United States Bicentennial project. Since then, the Freeman Store and Museum has been operated by volunteers. “The State’s recognition for this property is most welcome. Historic Vienna, Inc., board members have been working hard on this project for quite some time and are pleased with the outcome and the significance of this designation to the community as a whole,” said HVI President Anne Stuntz at the time of the designation. On May 15, 2012, the National Park Service approved the Freeman Store and Museum’s application and listed the building in the National Register of Historic Places (NRHP). To view the Town’s application, visit www.dhr.virginia.gov/registers/Counties/Fairfax/153-0002_Freeman_Store_2011_NRHP_Draft.pdf. To view photos of the building nomination, visit www.dhr.virginia.gov/registers/Counties/Fairfax/153-0002_FreemanStore.Photos.html. For more information on the Virginia Department of Historic Resources, visit www.dhr.virginia.gov/registers/register.htm. A special thank you goes out to the Town of Vienna and to Kirstyn Barr, Public Information Officer, for sharing a version of this article and the linked resources with Historic Vienna, Inc.